When their tribe in Britain is conquered by the Romans, Bran and his young sister, Hilda, are taken to Rome and sold as slaves. Filled with anger, Bran grows to hate everyone except Hilda. Meanwhile, she hears stories of the Roman god, Saturn, and longs for the day when he will rule the world in a Golden Age where everyone will be happy and free. One day, an elderly slave takes Hilda to hear a prisoner named Paul and she learns of another God, a God who made the heavens and the earth and who loves slaves. What will it cost Hilda and Bran if they decide to follow this new God? Story Setting: Ancient Rome in 63 A.D.
"When this book arrived I looked it over, and [my 4th grade daughter] snagged it immediately. She read it all in one day. :)" ~ Laura L.
"We could not get enough of this book and it was hard to put it down! 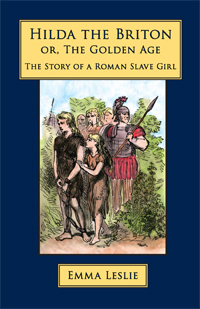 It showed how God can work through even a young slave girl to change the hearts of many." ~ C. T.